The Go Power! Solar Flex™ panel is aerodynamic and DURABLE—a low-profile and bendable solar battery charger for RVs, boats, work trucks, long-haul trailers, and sleeper cabs. 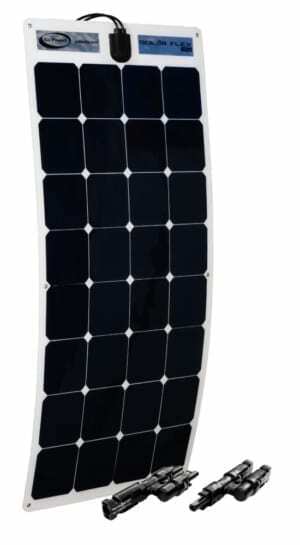 This solar panel conforms to almost any surface and is designed to provide a powerful charging solution for batteries. The high-efficiency monocrystalline cells produce more power per square foot than any other flexible panel on the market. An impermeable lamination coats the entire Solar Flex™ module, allowing it to contour and flex against curved surfaces, eliminating any need for custom mounts. The panel can be affixed by adhesive or screws, and grommets are provided for ease of installation. The thin, lightweight module can also be, making this a truly versatile solar module. As your need for power grows, so can your RV solar system by adding additional modules to your existing Solar Kits or even to the Weekender SW and Solar Elite charging system. Each Go Power! expansion kit includes a solar module, mounting hardware and expansion connections to quickly connect to the existing solar module on your RV roof. All Go Power! Solar Expansion kits are compatible with one another – using 80 watts or higher. Go Power! Expansion kits feature MC4 connectors (multi-contact) for parallel wiring between our solar kits. This interlocking system allows for a simple installation that is reliable and safe. As your need for power grows, so can your RV solar system by adding additional modules to your existing Solar Kits or even to the Weekender ISW and Solar Elite charging system. Each Go Power! 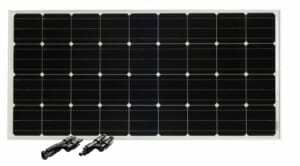 expansion kit includes a solar module, mounting hardware and expansion connections to quickly connect to the existing solar module on your RV roof. All Go Power! Solar Expansion kits are compatible with one another – using 80 watts or higher.